Imagine you are relaxing in a park and suddenly a man, followed by a big crowd, journalists, cameras and police, reaches out to greet you. 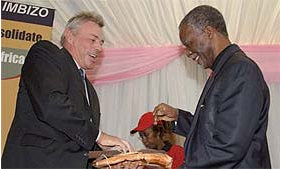 "My name is Thabo Mbeki, I'm very pleased to meet you," the man says. This is what happened to Freddy Nkuna at Thokoza Park during President Mbeki's two-day imbizo in Soweto and Johannesburg recently. Nkuna was lying on his back under a tree. He said he knew Mbeki was going to visit the park, but never thought the President would speak to him. "He is a very friendly person," said Nkuna, who is from White City, Soweto. Nkuna experienced how government is making personal contact with people through its imbizo programme. Mbeki was accompanied by senior government officials including ministers, Gauteng premier Mbhazima Shilowa, MECs, Johannesburg mayor, Amos Masondo and representatives of the business sector. 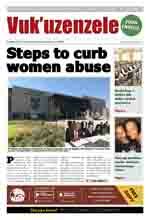 There are two National Imbizo Weeks a year, one in April and another in October. During this time, government leaders visit hundreds of communities. People get a chance to speak their minds to their leaders about their problems, while government takes note of the concerns and responds to them. Izimbizo are also held throughout the year. After President Mbeki visited a number of places and projects in Soweto, he talked to thousands of people at Klipspruit Stadium in Pimville. The President listened to the community's complaints about housing shortages, unemployment, crime, electricity, dirty townships and a lack of money to start small businesses. "We have heard your call of Vuk'uzenzele, Mr President, but we don't have money to start and run our own businesses and projects," one resident said. The President and his representatives noted the community's questions and concerns and promised to act on them. Many people registered their complaints at a special desk. Mbeki said that councillors who did not attend to the community's problems, must be reported to government or their political parties. Councillors have committed themselves to work for the people when they were appointed. Councillors who are not helpful, should be reported. If people who pledged to work for their communities don't, they will be replaced by people who want to work, Mbeki said. Talking about crime, Mbeki said communities should work together to stop crime. "People buy stolen goods and turn to the President to complain about crime. Don't ask the President about crime when you are part of it," he said. The President visited Orlando Stadium to see for himself how construction was progressing. The stadium will be one of the 2010 World Cup venues for training and friendly matches. Mbeki also stopped over at the Gautrain Station in Braamfontein. He was assured that the stations in Johannesburg, Midrand, Sandton and at OR Tambo International Airport, will all be ready for the World Cup. government departments and businesses will be more willing to put money into municipalities that have clear development plans. The violence of some service delivery protests is not necessary. It only destroys what government has achieved over the past years to bring a better life to all South Africans. Government has a much better chance of meeting service-delivery needs if communities join hands and work together. Ordinary people can help government through Integrated Development Plans. These are plans that set out all the different things that should be done to develop an area. On local government level, residents can tell their councillors about their service-delivery problems and development needs. They can also tell their leaders which of their needs should be dealt with first and which ones could be taken care of at a later stage. They can make suggestions on how their problems could be solved. 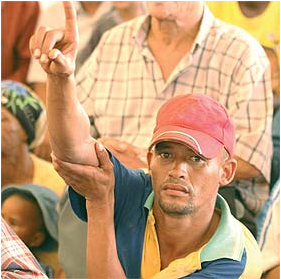 To do this, every municipality must hold public meetings where residents can talk freely to their councillors. Municipalities also have a responsibility to tell communities how the money in their budgets will be used. It is important that everyone in the community attend the meetings including the youth, physically disabled and senior citizens. If residents do not get involved in the meetings, the responsible premier and the MEC for Local Government and Housing cannot give the go-ahead for development plans to be carried out. It is the mayor's responsibility to make sure that community members are fully involved in the Integrated Development Plan. The mayor must also make sure that the plan and the budget serves the community's most important needs.